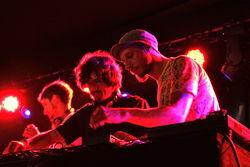 "That first night finished off with a DJ set from three DJs (Oops, Pezao & Barata) from the Brazilian collective, Criolina. Hailing from Brasilia, the capital of their country, they have been together for five years, playing every Monday and pulling an average audience of 700 a time (yes, on a Monday!) with spin off nights in São Paulo and Rio de Janeiro. Only three of the five main guys came over for this, but what a show. It's not easy to get a large room of world musos rocking at 1.45 in the morning after they've worked all day long and then seen half a dozen or more amazing bands already that night, but these guys pulled it off. "... one musical vision and one brain split between three bodies." Working as one they selected, dissected, tweaked and twiddled over and around each other without let up as they shared one musical vision and one brain split between three bodies. What truly made them good was not so much the technical virtuosity they displayed whilst setting bits of one tune against the rhythm of another, but the choice of raw material they sourced it all from (and it wasn't just Brazilian music either). "This was no boringly predictable mishmash of pre-programmed loops and beats ..."
This was no boringly predictable mishmash of pre-programmed loops and beats from the myriad of DJ-software out there, but authentic tunes - real music - that would probably sound perfect played with no cutting and splicing anyway; and it's that quality that shone through - these guys really love the tunes they played.